Themed as “Advancing Urban Innovations to Achieve SDG 11 and the New Urban Agenda (NUA)”, the 2018 Annual Session of Global Forum on Human Settlements brought together over 400 major stakeholders from more than 40 countries for sharing experiences and building sustainability partnerships. 6 bilateral meetings and 8 parallel sessions were held and some 60 speakers contributed to diverse in-depth discussions. Meanwhile, the International Green Model City animation film was premiered, and the Sustainable City and Human Settlements Awards were presented to 36 outstanding practices. Over 900 mainstream media reported this global sustainability congress. GFHS 2018 has emphasized not only the great potential of cities to foster innovation and realize green growth, but also the profound significance of well-designed policies, strategies and approaches to maximize the benefits of local actions. Through in-depth discussions, the Forum offered important references and solutions for the old and emerging sustainable development challenges. The Forum came to a productive close by setting the way forward and calling to enhance the localization of SDGs and the New Urban Agenda and achieve the transition to green growth through the application of a circular economy approach, scaling up financing for sustainable urban infrastructure, applying blockchain and other innovative technologies for smart cities, improving urban water management, building better, lasting and enhanced partnership and creating international green model city. 1. We stress that cities are at the forefront of the global battle against climate change, and cities have the potential to shape the future of humankind and to win the battle for sustainable development. As such, the leadership role of mayors and city governments is of fundamental importance. 2. We reaffirm the urgent need to update and strengthen the nationally determined contributions (NDCs), formulate and communicate long-term emission reduction strategies, deliver meaningful carbon pricing and product regulation and phase out fossil fuel subsidies, for achieving carbon neutrality by mid-century. 3. 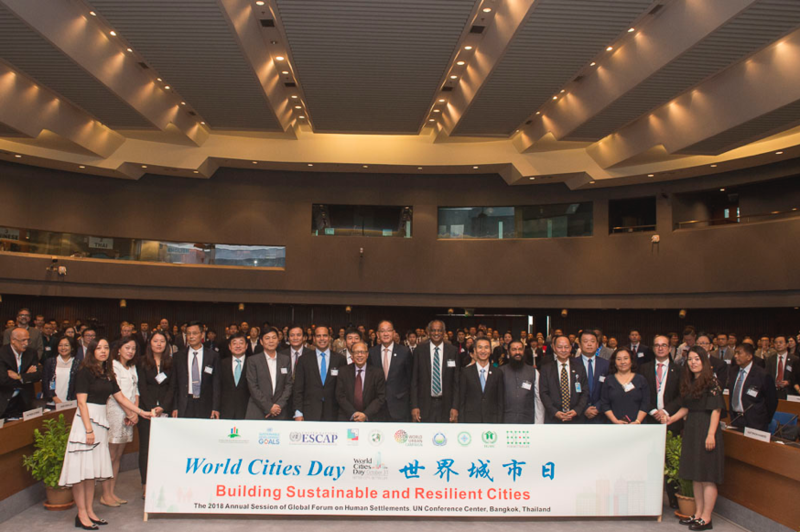 We reaffirm that cities have been the engine of growth in Asia in the past decades, but shared and collective responsibility is key to achieve shared and collective prosperity in cities. If we are successful in working toward the objectives of the 2030 Agenda and the New Urban Agenda, we will reshape the cities of the Asia-Pacific region, so they look and function very differently than they do today. 4. We emphasize that innovation as a strategic investment can offer benefits to all stakeholders, and cities, supported by strong partnerships, can build great communities. 5. We reaffirm that unless women and communities are involved in decision making and policy development at every level of governance, changes to women’s political and socio-economic status will be minimal. 6. We call for a combination of a humanitarian and a human rights approach to respond to the state of sheer homelessness in the world today along with the immense crisis faced by millions living in inadequate and insecure housing and living conditions. 7. We call for breaking the political, economic, social, gender and even geographic hierarchy and building up comprehensive, cooperative, pragmatic and equal partnerships, which is essential for the implementation of the SDGs and the New Urban Agenda. 8. We recognize that cities in least developed countries (LDCs), landlocked developed countries (LLDCs), and small island developing states (SIDS) are confronting increasing challenges of urbanization and climate change. Disaster support funds and investment in upgrading infrastructures are more needed now than ever before. 9. We emphasize that the value sets from a national government perspective and local government perspective should be aligned, and the critical importance of long-term policy commitments for low-carbon and resilient cities. 10. We underscore that green cities should resemble trees that are characterized by self-sufficiency, environment friendliness, resource circulation, interconnection, inclusivity and equity. 11. We affirm that cities are mainly processes where there are dynamics, transformations, continuous changes, and circularity of resources. To make cities work and sustainable, we need to be a problem-solver,comprehend the complexity of cities, plan with policies, plan with nature, plan for future generations and focus on the impact of planning. 12. We stress the importance of taking a participatory planning approach that can help identify conflict of interest, turn complexity into harmony and facilitate co-production of knowledge. Values based management frameworks and public participation are proven useful tools in spatial and urban planning. 13. We recommend to extensively adopt nature-based solutions, to avoid over-engineering the cities for the sake of sustainability, because the more artificial a city the less resilient to climate change it will be. 14. We stress the importance of widely applying a clear and operational measurement system, e.g., the Sustainable Urban Transport Index (SUTI) with ten key indicators developed by UNESCAP, to assess the sustainability of urban transport systems since the evaluation results will contribute to making evidence-based decisions and refine polices. 15. We emphasize that sustainable modern tourism has the power of bringing the old houses into the modern age by saving declining rural regions, stabilizing the local community and enhancing local cultural identity. 16. We call for effective actions to move from a linear economy to a circular economy through creating value for all sectors. We recommend to identify and recognize excellent circular economy projects and practices at local level and lift them up to grow their influence and impact, thereby making them duplicated at a wider range. 17. We recognize that too much emphasis on “downstream” waste management has limited many business opportunities whereas too limited efforts are made on “upstream” resource management and waste reduction, and this waste dilemma must be addressed through rational decision-making, implementable frameworks, knowledge expansion, and behavior change. 18. We recommend to conduct a fair, holistic assessment for the increasing complexity of waste streams to sustainably manage different waste streams which have great influence on the conservation of environmental assets and natural resources. 19. We stress that a Zero Waste society is a low carbon and resilient society, climate-related criteria therefore needs to be integrated into the rules and regulations for waste management. We also emphasize the need to assist communities in their climate-friendly behavior change, through massive education and engaging activities targeting youth, adults, businesses, and municipalities. 20. We emphasize that resilient cities can attract more investment opportunities and provide predictable benefit to investor under a wide range of circumstances that increase the reliability of investment returns and asset values. 21. We call for a shift from a centralized water management to a decentralized model, and the use of innovative methods for funding to alleviate water stress that will threaten half the population by 2030 and affect not just drinking water but also material, energy, and manufacturing processes. 22. We recommend that UN ESCAP, UN-Habitat, UN Environment, and UNESCO develop one UN strategy and reinforce actions to support sustainable urban water management. 23. We recommend to use effective tools and methods to develop a ‘water logging map’ that can tell which areas are frequented by flooding. We must consider cities as living being and adopt water ‘budget’ through comprehensive water planning, monitoring and evaluation. We also recommend to unblock water scarcity through blockchain that can help collect and store data to ensure transparency and reliability. 24. We commit ourselves to promoting inclusive urban water management and providing marginalized communities access to clean safe and affordable water to prevent diseases. 25. We underscore that blockchain technology can create more trust through more reliable ledgering and record keeping of activities, and the actual application of blockchain technology on the ground should be people-oriented. How the basic elements including governance, smart contract, decentralized ledger, and asset transmission are designed, implemented, tracked and evaluated will impact the effects of blockchain. 26. We recommend to use blockchain to link up all aspects in cities to realize highly efficient urban management, as well as to transact the non-financial intangible value of investments in cities. 27. We recognize that fabricated building plays a significant role in the transformation of old cities, and it should attach as much importance to culture and human comfort as technical materials. 28. We recommend to rehabilitate old blocks in accordance with the key principles including i) maintaining a permanent population to make living city; ii) respecting the identity of the place; iii) upgrading infrastructure through public investment; and iv) encouraging property owners to carry out the works for improving comfort and energy saving in their houses. 29. We recommend to hold investment companies accountable for their decisions and expect that financial markets will penalize them for not putting environmental, social and governance (ESG) issues into consideration. More focus should be given to the economical internal rate of return rather than the financial internal rate of return. 30. We recommend to scale up dedicated finance instruments including energy service agreements, green mortgages, green bonds to better support urban infrastructure financing for sustainable cities. In the meantime, the sustainability standards as a risk mitigator and value creator need to be incorporated into project preparation so as to improve the bankability of projects. 1. As an innovative greener urban development action plan, IGMC Initiative aims to use IGMC Standards 3.0 as an effective planning tool for assessing and guiding sustainable urban development and conducting pilots through providing innovative concepts, integrated strategies and methodologies, benchmarks and monitoring framework as well as demand-oriented solutions. Supported by IGMC online assessment and rating system and combined with other approaches, IGMC Initiative enhances assets value and urban competitiveness and facilitates sustainable cities and human settlements for all, while creating a shared platform among its global partners and concerned stakeholders for the sake of establishing new partnerships in support to the implementation of the SDGs and the NUA. 2. Indore Municipal Corporation applied a systematic approach by adopting Identification, Transformation and Sustainable measures for serving city’s long-term goals of processing Municipal Solid Waste and integrating cleanliness behavior and citizens awareness and participation. With a clear political will and commitment, with effective involvement of the community and stakeholders, and with efficient governance system, we can plan and develop a Bin Free, Litter Free and Dust Free City. 3. Chiiori – a 300 year old thatched cottage initiates a new type of sustainable tourism. By restoring and reinvigorating the old abandoned farmhouses, Chiiori has become a hot tourist destination and attracted over 30,000 visitors during 1990 – 2010. Specifically, the houses are passively designed and energy-efficient, local goods and organic food are well received, and young people are attracted to voluntarily manage the houses. This represents an excellent example of revitalizing historical, cultural and rural properties through sustainable tourism. 4. To leverage private sector investment in transforming the substandard, climate-vulnerable, and heavily polluting areas into affordable, low carbon, climate-resilient, and livable eco-districts, Ulaanbaatar green affordable housing and resilient urban renewal sector project with a total estimated investment of 542 million USD will deliver 10,000 affordable green housing units and redevelop 100 hectares of ger-areas into eco-districts between 2019 and 2022. 5. Preparedness is a shared responsibility. A Whole Community Approach contributes to building more resilient and inclusive preparedness activities and response plans in City of Santa Monica. In 2017, the City became the first city in the world to enact a Zero Net Energy requirement for new homes. Santa Monica is committed to eliminating imported water to achieve water self-sufficiency by 2020. 6. By 2020 more than $1 billion annually will be invested in projects to transform California’s disadvantaged communities. California’s Grant Program to create Advanced Energy Communities (AEC) that integrates the key elements of blockchain community, prosumer network, smart community solar+storage, energy efficiency, microgrid resiliency hub, mobile grid as well community action is expected to bring about multiple positive changes by providing affordable 100% renewable electricity for homes and schools, offering greater access to zero emission vehicles, creating local green economy jobs and building resilient local energy system. 7. Australia’s clarity on blockchain regulations, combined with the maturity of its water market has fostered a high level of innovation. Civic Ledger, an Australian civic-focused blockchain company, created WaterLedger™ as a way to improve transparency of water trading in the country’s water markets. The system’s integration of over 15,000 complex business rules and real-time updates of state water registries was enabled by smart contracts. 8. Kawasaki Eco-Town where economy and environment are integrated not only creates sustainable business opportunities, but also enhances urban resilience by preventing pollution. The key features include revitalization through environmental technologies accumulated in traditional industries; industrial symbiosis through a regional network for resource reuse/recycling; local private companies engaging in environmentally sound business operations; strong collaboration between R&D industries and private companies on environmental technologies; and international cooperation in technology transfer. 9. Kalundborg Symbiosis created a unique public-private partnership focusing on sustainability and financial growth to make a bigger pie for all to share. The industrial ecosystem covers 22 different types of streams in water, energy and materials, and each stream also represents an agreement / contract between two or more partners. The ecosystem creates an enabling environment to use local resources at lower prices, lower costs for handling waste, make income from residuals, realize better return of investments through co-investments, contribute to reach CSR goals, and reduce CO2 emissions and consumption of virgin materials and groundwater. 10. The blockchain mobile app “Climate Drops” keeps track of specific climate-friendly actions of its users, converts the actions into electronic points, called Climate Drops, and allows their exchange on discounts at Apps’ Partners from eco-responsible businesses. It is also the engine for eco-friendly school contest through which pupils and teachers from 55 schools of Ukraine have already reduced 355 tonnes of CO2 since April 2018 by planting trees, recycling waste and saving energy in buildings. Efforts are also being stepped up to execute the core of the commitment they made at the 2018 Annual Session of Global Forum on Human Settlements – to get one million tonnes of CO2 savings through behavior change and pro-climate action in human settlements, with the help of Climate Drops mobile application and its school contest. This innovative approach to unite people, businesses and cities in combating climate change should be replicate over a wider range, thus scaling up its positive effects, promoting feasible behavior change and multi-stakeholder cooperation.